Creative Writing Competition 2017 in collaboration with O.U.P. 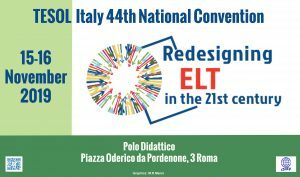 “People on the Move” was presented at TESOL Italy’s 41st National Convention in November. Prize-giving ceremony of the Creative Writing Competition in collaboration with O.U.P. “Be creative with Shakespeare” was held at Liceo Scientifico Teresa Gullace Talotta on Friday May 13th. Creative Writing Competition 2016 in collaboration with O.U.P. : “Be Creative with Shakespeare”. The competition was dedicated to Shakespeare to commemorate the 400th anniversary of Shakespeare’s death. An afternoon seminar entitled La certificazione delle competenze led by Maria Luisa Pezzulli – O.U.P., L.S.S. “Primo Levi” (20th Feb). An afternoon seminar entitled Motivating Teenagers: Using Webquests for English Language Learning led by Donatella Fitzgerald – O.U.P. and presentation of the 5th edition of the creative writing competition entitled Save the Earth! led by Maria Grazia Maglione and Maria Antonietta Ortenzi and held at L.S.S. “Primo Levi” (10th Jan) and L.S.S. “Teresa Gullace Talotta” (15 Jan). Creative Writing Competition 2013 in collaboration with O.U.P. : “School is cool”. The topic was chosen to give students the opportunity of expressing their own creativity and writing for pleasure about a crucial topic: school. Creative Writing Competition 2012 in collaboration with O.U.P. :”Unification of Italy” to celebrate the 150th anniversary of Unification of Italy. The idea is to see how the new generations face this issue from their own personal experience and point of view.